Shares of Monte dei Paschi di Siena, the world’s oldest bank and by now the world’s most famous penny stock, trade at €0.18. Things have gotten so bad that Italy’s financial markets regulator Consob extended the deadline and widened the scope of its ban on short selling of the bank’s shares. The restrictions were initially introduced on July 7 just after the bank’s shares had crashed 20% in one day. Since then they have shed a further 45%. Doubts continue to mount over the chances of success for the bank’s latest rescue program, its third since the Global Financial Crisis began. “The situation has got more complicated,” reported Il Corriere della Sera, one of Italy’s most influential newspapers. It’s also apparently quite “dark” — as in sinister. “For weeks, MPS has been in the center of dark, worrying maneuvers,” said Azione Mps, an association of the bank’s retail shareholders. If the worst comes to the worst, the institution they’re invested in will either be bailed-in, resulting in a complete loss of their already basically worthless investment, and/or bailed-out by either Italy’s government or the ECB, in the process massively diluting the value of their already basically worthless shares. Nonetheless, “dark” is an interesting turn of phrase, especially given that the Italian bank’s latest desperate bid to save its derriere without outright state intervention is being led by America’s most corrupt financial institution (according to Forbes), JP Morgan Chase. Also, in recent days MPS’ head offices, fittingly housed within a restored ancient fortress, have been transformed into a gargantuan crime scene after a Milan court ordered MPS, Nomura and Deutsche Bank to stand trial for a string of alleged financial crimes, including crimes that the Bank of Italy, under Mario Draghi’s tutelage, apparently knew about yet sat on its hands. The court also indicted 13 former and current managers from the three banks over the case, with prosecutors alleging they had used complex derivatives trades to conceal losses at MPS, in much the same way that Goldman Sachs helped the Greek government to conceal its mountain of excess debt with complex derivatives. [Interestingly, MPS also had a derivatives contract with JP Morgan Chase — the 2006 “Nota Italia” trade — though nothing incriminating has surfaced]. Just as in Greece, MPS’ cleverly concealed debt bomb has had explosive consequences, especially when combined with the bank’s over €40 billion of non-performing loans. Things have gotten so serious that on Monday Italy’s Minister of Economy, Pier Carlo Padoan, called a closed door meeting with the leading figures of the country’s banking sector, including the Bank of Italy’s governor, Vincenzo Visco. Allegedly under discussion was not just the fate of MPS but also of other smaller struggling Italian banks such as Banca Marche, Etruria, Carife and CariChieti. But it’s MPS’ slow-motion collapse that is keeping senior members of Italy’s government and banking institutions awake at night. As we warned a couple of weeks ago, the chances of JP Morgan’s rescue plan actually working were razor slim. It essentially involves raising €5 billion in fresh capital for a bank whose market cap has shrunk so much that it is now worth just one-tenth of that amount, and what’s more from investors who have already lost (squandered) billions of euros in two previous cash calls. “The problem is that raising the funds (for MPS) is proving to be a very difficult challenge — much more so than was presented in the optimistic rescue plan,” said Nicola Borri, an analyst at Luiss de Roma University. For the moment that plan is going sideways. As Federico de Bortoli, the former director of ‘Il Corriere’, put it, nothing of any substance has been signed apart from a pre-underwriting agreement, which amounts to “little more than a handshake.” In other words, there’s no commitment. And if there’s no commitment, there’s still no deal. Deal or no deal, JP Morgan Chase and its Italian co-underwriter Mediobanca can be expected to walk away with their fees in tact. They’re likely to add up to a fair amount of money: as much as €250 million in underwriting fees, plus an extra €300 million or so for setting up a €6-billion syndicated bridge loan. For JP Morgan Chase, that’s just the beginning of the windfalls it is likely to accrue from Italy’s burgeoning financial crisis. The bank, whose CEO Jamie Dimon seemingly enjoys cozy ties with Italy’s premier Matteo Renzi and who was recently been anointed Italy’s “unlikely savior” by the Wall Street Journal, also picked up a little something from helping Banca Popolare di Bari SCpA offload half a billion euros of bad loans from its balance sheet. It is also helping Italy’s largest bank, UniCredit SpA, drum up at least €8 billion ($8.9 billion) of capital. The more perilous Italy’s financial situation gets, the more money there is to be made for America’s “most corrupt bank.” As the old adage goes, where there is crisis, there’s always opportunity. And if you can help create the conditions that lead to crisis — as banks like JP Morgan Chase and Goldman Sachs have done throughout this fledgling century — you can be in a perfect position to reap the opportunities. This entry was posted in Banana republic, Banking industry, Doomsday scenarios, Europe, Guest Post, Legal, Politics, Regulations and regulators on October 5, 2016 by Yves Smith. 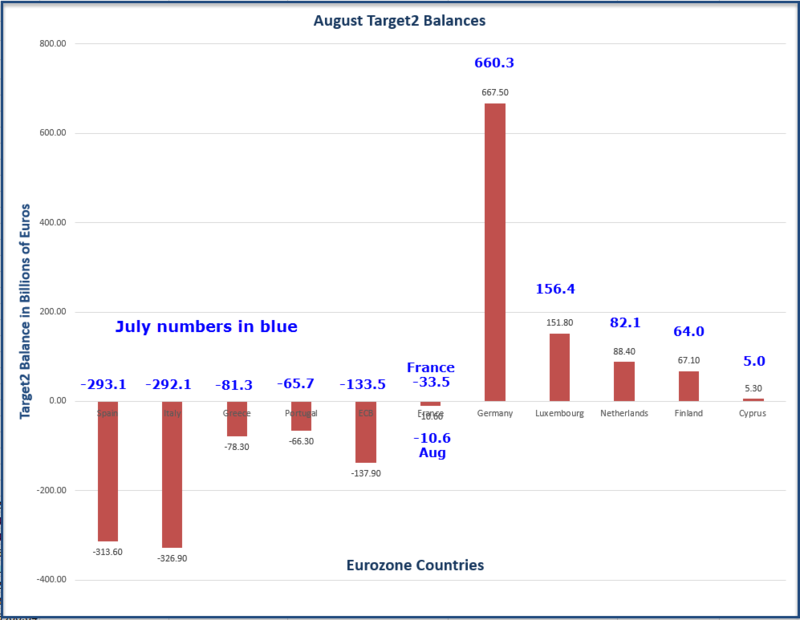 Meanwhile, a chart from Mish Shedlock shows that balances in the eurozone’s Target2 system have reached “beanstalk to the sky” proportions. That is, fiscally righteous northern europeans (picture the stern visage of Jeb Dieselboom) have lent the happy-go-lucky olive oil nations (Spain, Portugal, Greece, Italy) nearly a trillion euros. Since Target2’s designers neglected to incorporate credit limits, these [im]balances can carry on metastasizing growing. But as Germany’s teetering banks indicate, eventually the weak will take down the strong with them, as with the Whymper party on the Matterhorn. More importantly though, one member of the “gang” is named Alessandro Toccafondi: literallly, “gets his hands on money”.